Some and Any are used when it is not easy or necessary to say exactly the number of something. 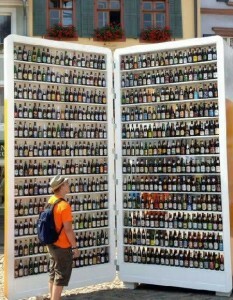 Is there any beer in the fridge? There is some. Some is for positive sentences. Any is for negative sentences and questions. • I will buy some beer. • Have you got any beer? • You never give me any beer. Some can be used in questions when we want or think the answer will be yes. • Would you like some more tea? • Could I have some tea, please? Remember: Some for positive sentences, and when we want or think the answer will be yes. Any for negative sentences and questions. Use some or any to complete the sentences. She wants to buy ___ books. She wants to buy some books. Do you want to buy ___ books? Do you want to buy any books? Any for negative sentences and questions. Gary, do you want ___ beer? Gary, do you want some beer? Some for when we want or think the answer will be yes. Do you have ___ children? Gabriel often meets ___ friends on Saturdays. Gabriel often meets some friends on Saturdays. I don’t like our new neighbours. Let’s listen to ___ loud music. I don’t like our new neighbours. Let’s listen to some loud music. She always takes ___ sugar with her coffee, but she doesn’t take ___ milk. She always takes (some) sugar with her coffee, but she doesn’t take (any) milk. She always takes some sugar with her coffee, but she doesn’t take any milk. I see that the cat has been in the fridge again – there isn’t ___ milk. I will go and get ___. I see that the cat has been in the fridge again – there isn’t (any) milk. I will go and get (some). I see that the cat has been in the fridge again – there isn’t any milk. I will go and get some. There aren’t ___ clean socks in my drawer. There aren’t (any) clean socks in my drawer. There aren’t any clean socks in my drawer. Marcin never gives his mother ___ help. Marcin never gives his mother (any) help. Marcin never gives his mother any help. Do you have ___ idea what they are doing there? Do you have (any) idea what they are doing there? Do you have any idea what they are doing there? No, I don’t have ___, but I know you will have ___. No, I don’t have (any), but I know you will have (some). No, I don’t have any, but I know you will have some. Any for negative sentences. Some for when we want or think the answer will be yes. I need a hammer and ___ nails. I need a hammer and (some) nails. I need a hammer and some nails. We had to wait for ___ minutes until he arrived. We had to wait for (some) minutes until he arrived. We had to wait for some minutes until he arrived. I’d like ___ time off next week as I am getting divorced, and I will have a party. I’d like (some) time off next week as I am getting divorced, and I will have a party. I’d like some time off next week as I am getting divorced, and I will have a party. Will you have ___ free time later? Will you have (any) free time later? Will you have any free time later? You shouldn’t take ___ medicine without reading the label first. You shouldn’t take (any) medicine without reading the label first. You shouldn’t take any medicine without reading the label first. I can’t find ___ film that sounds interesting enough to make me leave my sofa. I can’t find (any) film that sounds interesting enough to make me leave my sofa. I can’t find any film that sounds interesting enough to make me leave my sofa. 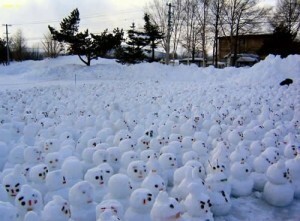 Where there some snowmen in the park?